There’s a sense of freedom that comes with rummaging through a box of loose LEGO bricks. You can choose to build something specific, or let your imagination run wild with the endless possibilities. Either way, the opportunity to transform these simple plastic bricks into something really amazing gets you thinking creatively. Maria Mejia encourages learners to stack bricks based on categories in this fun drag-and-drop activity. In this example, Tracy Williams uses LEGO bricks to teach color mixing in a clever way. Because they’re so simple, LEGO bricks can be used to represent almost anything—even chemical compounds! See what that looks like in this example by Rambo Levin. Dianne Hope uses LEGO bricks to teach young audiences about colors, reading, and basic math in this example. 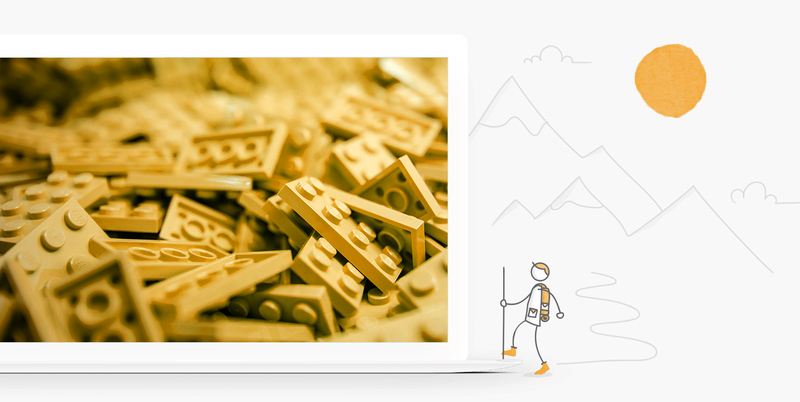 The LEGO-themed E-Learning Challenge is still open if you’d like to share your work with the community! And follow us on Twitter and come back to E-Learning Heroes regularly for more helpful advice on everything related to e-learning. If you have any questions, please share them in the comments. Great challenge, love the results. I'm new to Articulate but I look forward to accepting a challenge in the future. Question, where can I find images of Legos to use in a course? Hi Denise - You could try some of the stock photo sites like Shutterstock, ThinkStock, and iStock. In the challenge post, some users took their own photos to use for demos. Good examples, however, are there issues with the use of a registered trademark i.e. Lego? Hi David, Great question and one I hear often. There are trademark guidelines in how to use LEGO in production material. The LEGO name, the brick itself, any reference to the studs, and Minifigs are all protected. Obviously, using the LEGO name to promote something other than an official LEGO product or service is infringement. Any representation of a brick, studs (backgrounds, mosaic graphics, etc. ), and the use of Minifigs is also protected. Here's where it gets iffy. There are a TON of images, graphics, photos, etc. on the web and many of those are even sold with usage licenses. The fine line is "how" they're used. For these Elearning examples it's perfectly fine (in my view) because they're for personal portfolios. Or if someone designed a presentation to give a talk using LEGO theme and *not* leveraging the actual company as a way to promote one's own product or service, then you should be okay. However, if a LEGO themed course is designed for use to benefit an organization or sold as a course seat, then it becomes copyright infringement because of the use of an official trademark for personal profit. Example: I had a client last year wanting me to design and develop a course on the subject of Profit & Loss Statements in the LEGO theme. I respectfully declined. Hope this answers your question and helps others. Thanks for the examples. They were fun and engaging.